Everyone was impressed by the initial videos of Jett Rocket when they first came out, but they don't prepare you for the experience of playing the game itself. We were lucky enough to play a preview build consisting of the first area and it's probably safe to say that based upon our experience this could be the definitive 3D platformer for WiiWare. The introduction shows Jett in his job as planet inspector of Yoroppa when the dastardly Power Plant Posse comes to steal the planet's energy reserves. 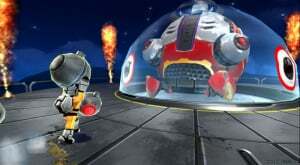 He needs to shut down their operations and retrieve the three energy capsules removed from his ship by defeating the three bosses located in different parts of the planet in order to save the day, so there's no time to lose! Each boss is found in an area divided into four levels. 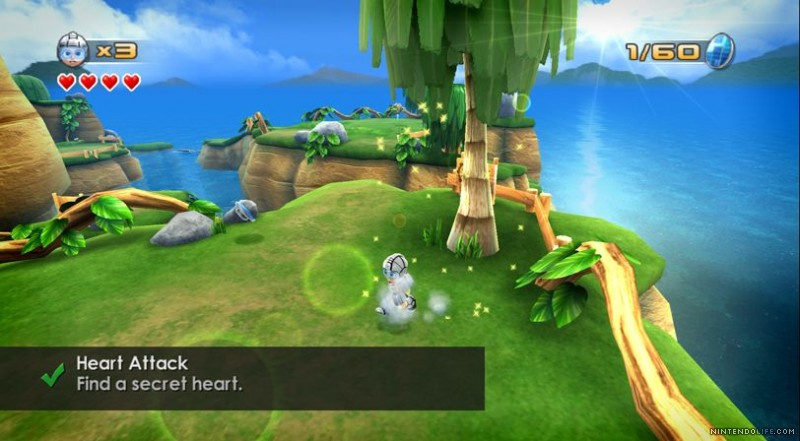 The first area's levels are located on different islands, with Level 1 acting as a primer for the rest of the game. Jett is moved with , whilst jumps and is used to read signs and chat with helpful maintenance bots and your dolphin friend, Rudolpho. Dashing with a quick Remote wave is your primary means of attack and a handy way to hop on a lift if you don't want to wait for it to come back down again. 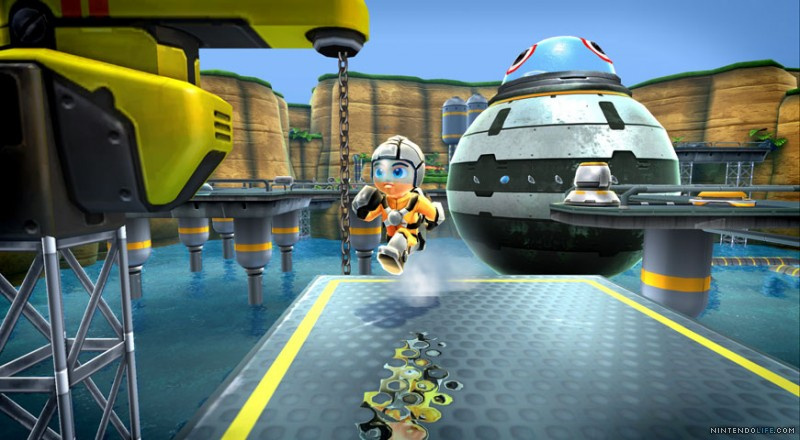 Jumping and swinging your Remote will cause Jett to do a ground slam attack for hitting switches, finding buried items and taking out robots with specific weak spots. If you've ever played a 3D platformer this will all be very familiar and Jett Rocket certainly isn't setting out to do anything new in that regard. What is new is that this has been managed on WiiWare: a download service with some pretty well-known space limitations. Some of the textures are a little fuzzy, but mostly the development team have gone for a simpler look of bright colours and clean lines, focusing more on an extremely smooth framerate and quality animation (though we must say the water and reflection effects look fantastic.) The levels themselves are pretty large – just for fun we decided to swim away from the starting island on the intro level and got quite far out to sea before we hit the apparent end of the line; we also enjoyed rotating the camera whilst up on high places to get a panoramic view of levels when possible. It's fair to say that Shin'en has some very accomplished Wii programmers on staff because honestly we wouldn't believe this game was possible in WiiWare if we weren't playing it. Most of the gameplay is your basic A to B travel, though you'll need to collect solar cells on the way to unlock access to the other areas of the planet. The level design is good and we never got lost, but it's also never so direct that we got bored either. Most of the levels offered a good bit of vertical travel with the odd enemy robot here and there to smash on the way to get some extra solar cells. There are plenty of solar cells to collect on each level and 20 achievements for people who like collecting, so replaying levels to find all the hidden items will be fun for those who like a little exploration to go with their platforming. Aside from the achievements you'll be able to unlock animated "photos" for review in the "Gallery", a nice extra considering what's already included. Additional game concepts are introduced as you go, for example bomb dispensers that release bombs to destroy special barriers and energy points to charge up your jetpack to allow you to reach otherwise inaccessible ledges. Many of the harder to reach areas have energy portals that instantly warp you between two points, greatly reducing any frustration you might feel after missing a jump from a great height. You'll also find switches that rotate or otherwise alter parts of the power installations you're disabling, and there's even a spot of paragliding, wave-riding and propeller-grabbing to break up all that running and jumping. Aside from the stunning visuals there's a nice electro soundtrack and some quality sound effects, with the thudding footsteps of Jett as he tromps about the beaches leaving indelible footprints in the sand being a particular favourite. The intro movie even has a bit of voice work, which combined with some slick "Batman"-style level transitions gives the impression of a highly-polished release. 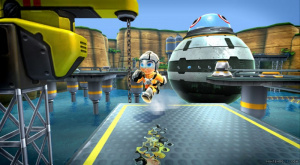 Whilst Jett Rocket doesn't break any new ground in gaming, it definitely feels like a solid 3D platformer, and on WiiWare that's an impressive feat. Shin'en got our attention with its command of Wii visuals in Art of Balance and if the full release of Jett Rocket is as solid as what we've played thus far, it'll have earned a place as one of the top developers on the platform full-stop. Sounds awesome. Hope it has plenty of replay value, otherwise I may end up blazing through this quickly. Awesome, but Shantae RR is my next download (sorry!). Later I might give it a try, though. Good to hear the gameplay also works well. Shame about the rather bland character design, because this title is otherwise very impressive indeed. I hope this does very well, I want to see more of Shin'en games on Wiiware. I hope they do a new Nanostray next. I'm sorry I didn't play Shantae... If I hadn't had other games I was playing back in the day at that time, I would've played this. I do still have a GBA SP... is that game THAT good? Looks good enough to be my first wiiware DL, but irken also agree with irken too. Or I would just end up skipping it anyways if it turns out to be a short and kinda easy type of game. @sean..... great preview man. Did they say how long the game will be? This looks awesome. As tealovertoma the character design looks like the only bad thing. "it's probably safe to say that based upon our experience this could be the definitive 3D platformer for WiiWare"
This just proves that the only real limitations come from the developers inflated artistic egoes. And for 1,000 it shall be placed next to Nyxquest, Swords and Soldiers and both Lost Winds games as one of the best games available on Wiiware. I just downloaded Art of Balance a few days ago and it's fantastic. I am pretty confident that this game will be excellent too. Definite day one purchase for me! It all sounds great. Can't wait to get my hands on this game and see how they put everything in only 40 MB. Might be the first game I download in over a year. I hope this starts a trend, I'd love to see more 3D platformers on the service trying to one-up each other. @ AlexSays: Shame on you for not getting LostWinds 2. According to the manual there are three areas with four levels each. I wouldn't expect an epic Super Mario Galaxy-style affair, but certainly it should equal other WiiWare platformers and occupy you for a few days. The final release isn't far off, so I expect the review will reveal more. This is the first I've seen of this (well I might have scanned over it before but I thought it was Rocket Knight on the PSN) and it looks promising. I'm halfway through SMG2 so I know it's possible to do good graphics on the Wii (52" 1080p). This looks like the sequel to Jak and Daxter I always wanted (as opposed to the one I got, good in it's own right as a GTA comedy). Very much want this to be nearly as good as it promises to be.